Sunil Manohar 'Sunny' Gavaskar pronunciation (help·info) (born 10 July 1949) is a former Indian international cricketer who played from the early 1970s to late 1980s for the Mumbai cricket team and Indian national team. Widely regarded as one of the greatest Test batsmen and best opening batsmen in Test cricket history, Gavaskar set world records during his career for the most Test runs and most Test centuries scored by any batsman. He held the record of 34 Test centuries for almost two decades before it was broken by Sachin Tendulkar in December 2005. He was the first person to score centuries in both innings of a Test match three times. He was the first Test batsman to score 10,000 Test Runs in a Career and now stands at number 12 on the group of 13 players with 10,000+ Test Runs. Gavaskar was widely admired for his technique against fast bowling, with a particularly high average of 65.45 against the West Indies, who possessed a four-pronged fast bowling attack regarded as the most vicious in Test history. His captaincy of the Indian team, however, was less successful. Turbulent performances of the team led to multiple exchanges of captaincy between Gavaskar and Kapil Dev, with one of Gavaskar's sackings coming just six months before Kapil led India to victory at the 1983 Cricket World Cup. Gavaskar is a recipient of the Indian civilian honours of the Padma Shri and the Padma Bhushan. In 2012, he was awarded the Col CK Nayudu Lifetime Achievement Award for Cricket in India. Born in Mumbai and a student of St Xavier's High School young Sunil Gavaskar was named India's Best Schoolboy Cricketer of the year in 1966 while playing for his school. He scored 246*, 222 and 85 in school cricket in his final year of secondary education before striking a century against the touring London schoolboys. He made his first-class debut for Vazir Sultan Colts XI against an XI from Dungarpur in 1966/67 but remained in Bombay's Ranji Trophy squad for the next two years without playing a match. An alumnus of Bombay's renowned St. Xavier's College, he made his debut in the 1968/69 season against Karnataka but made a duck and was the subject of derisive claims that his selection was due to the presence of his uncle Madhav Mantri, a former Indian Test wicket keeper on Bombay's selection committee. He responded with 114 against Rajasthan in his second match and two other consecutive centuries saw him being selected in the 1970/71 Indian team to tour the West Indies. After missing the first Test due to an infected fingernail, Gavaskar scored 65 and 67 not out in the second Test in Port-of-Spain, Trinidad, hitting the winning runs which gave India its first-ever win over the West Indies. He followed this with his first century, 116 and 64* in the third Test in Georgetown, Guyana, and 1 and 117* in the Fourth Test in Bridgetown, Barbados. He returned to Trinidad for the fifth Test and scored 124 and 220 to help India to its first ever series victory over the West Indies, and the only one until 2006. His performance in the Test made him the second player after Doug Walters to score a century and double century in the same match. He also became the first Indian to make four centuries in one Test series, the second Indian after Vijay Hazare to score two centuries in the same Test, and the third after Hazare and Polly Umrigar to score centuries in three consecutive innings. He was the first Indian to aggregate more than 700 runs in a series, and this 774 runs at 154.80 remain the most runs scored in a debut series by any batsman. Trinidad Calypso singer Lord Relator (Willard Harris) wrote a song in Gavaskar's honour, the "Gavaskar Calypso". Gavaskar's arrival in England in 1971 for a three-Test series generated substantial publicity in light of his debut series. He was unable to maintain his performance, making only two half-centuries. He was involved in controversy when taking a quick single from the bowling of John Snow. They collided and Gavaskar fell over. Snow was charged with deliberately barging into Gavaskar and was suspended. Gavaskar's 144 runs at the low average of 24, led some to question Gavaskar's worthiness in international cricket. In 1972–73, England toured India for a five-Test series, Gavaskar's first on home soil. He was ineffective in the first three Tests, accumulating only sixty runs in five innings as India took a 2–1 lead. He scored some runs in the final two Tests which India drew to complete consecutive series win over England. His first home series was largely disappointing, aggregating 224 runs at 24.89. His English critics were placated when India returned in 1974 and Gavaskar scored 101 and 58 in the second Test at Old Trafford. He managed 227 runs at 37.83 as India were whitewashed 3–0. Gavaskar's 1974–75 series against the West Indies was interrupted, playing in only the First and fifth and final Test of the series against the West Indies. He scored 108 runs at 27, with an 86 bowled by Lance Gibbs at Bombay's Wankhede Stadium hosting the first test on this ground, the closest the Indian public got to see a century. The Test was the start of a world record streak of 106 Test appearances. The 1975–76 season saw three and four Test tours of New Zealand and the West Indies respectively. Gavaskar led India in a Test for the first time in January 1976 against New Zealand during the First Test in Auckland when regular captain Bishen Bedi was suffering from a leg injury. Standing in despite having scored only 703 runs at 28.12 since his debut series, Gavaskar rewarded the selectors with 116 and 35*. As a result, India secured an eight-wicket victory. He ended the series with 266 runs at 66.33. On the West Indian leg of the tour, Gavaskar scored consecutive centuries of 156 and 102 in the Second and Third Tests, both in Port of Spain, Trinidad. These were his third and fourth centuries at the grounds. In the Third Test, his 102 helped India post 4/406 to set a world record for the highest winning fourth innings score. The Indians' mastery of the Caribbean spinners on a turning track reportedly led West Indian captain Clive Lloyd to vow that he would rely on pace alone in future Tests. Gavaskar totalled 390 runs at 55.71 for the series. Gavaskar was not to score a century on home soil until November 1976. In an eight-Test season, three and five against New Zealand and England respectively, Gavaskar scored centuries in the first and last Tests of the season. The first was 119 in front of his home crowd at the Wankhede Stadium, helping India to a victory. Gavaskar scored another half-century in the Second Test to end the series with 259 at 43.16. In the First Test against England at Delhi, he was mobbed upon becoming the first Indian to reach 1000 Test runs in a calendar year. A steady series saw him finish with 394 runs at 39.4 with a century coming in the Fifth Test and two half-centuries. In 1977–78 he toured Australia, scoring three consecutive Test centuries (113, 127, 118) in the second innings of the first three Tests at Brisbane, Perth and Melbourne respectively. India won the third but lost the earlier two. He finished the Five Test series with 450 runs at 50, failing twice as India lost the final Test and the series 3–2. 1978–79 saw India tour Pakistan for the first series between the arch-rivals for 17 years. For the first time, Gavaskar faced Pakistani pace spearhead Imran Khan, who described him as "The most compact batsman I've bowled to." Gavaskar scored 89 in the First Test and 97 in the Second, which India drew and lost respectively. Gavaskar saved his best for the Third Test in Karachi, scoring 111 and 137 in the Third, but was unable to prevent a defeat and series loss. His twin centuries made him the first Indian to score two centuries in one Test on two occasions, and saw him pass Umrigar as India's leading Test run-scorer. Gavaskar finished the series with 447 runs at 89.40. 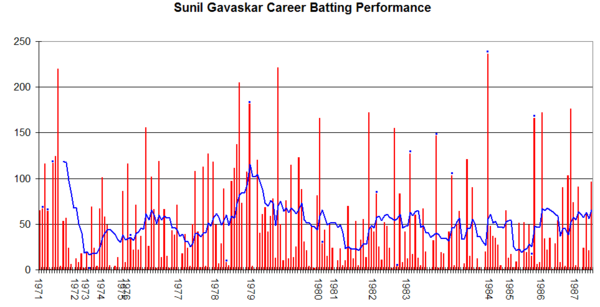 Sunil Gavaskar's career performance graph. His first series in charge was a West Indian visit to India for a six Test series. Gavaskar's several large centuries contrasted with several failures. His 205 in the First Test made him the first Indian to score a double century in India against the West Indies. He added a further 73 in the second innings of a high scoring draw. After failing to score in the Second Test, he scored 107 and 182 not out in the Third Test at Calcutta, another high scoring draw. This made him the first player in Test history to achieve centuries in both innings of a Test three times. He managed only 4 and 1 in the Fourth Test in Madras as India forced the only win of the series. He posted a fourth century for the series, scoring 120 in the Fifth Test at Delhi, becoming the first Indian to pass 4000 Test runs. He aggregated 732 runs at 91.50 for the series, securing India a 1–0 win in his first series as captain. Despite this, he was stripped of the captaincy when India toured England in 1979 for a four Test tour. The official reason given was that Srinivas Venkataraghavan was preferred due to his superior experience on English soil, but most observers believed that Gavaskar was punished because he was believed to be considering defecting to World Series Cricket. He started consistently, scoring four half-centuries in five innings of the first three Tests. It was in the Fourth Test at The Oval that he produced his finest innings on English soil. India was 1–0 down needed to reach a world record target of 438 to square the series. They reached 76/0 at stumps on the fourth day. Led by Gavaskar, India made steady progress to be 328/1 with 20 overs remaining on the final day with a record-breaking victory still possible. An Ian Botham led fightback saw Gavaskar removed, with India still needing 49 runs from 46 balls. With three balls left in the match, all four results were possible. India ended nine runs short with two wickets in hand when stumps were drawn. According to Sanjay Manjrekar, it was "Vintage Gavaskar, playing swing bowling to perfection, taking his time initially and then opening up. Nothing in the air, everything copybook." He ended the series with 542 runs at 77.42 and was named as one of the Wisden Cricketers of the Year. Gavaskar was restored to the captaincy for the gruelling 1979–80 season, with six Test home series against both Australia and Pakistan. The first two Tests against Australia were high scoring draws where only 45 wickets fell, with India taking a first-innings lead in both after making scores over 400. India broke through for a 153 run win in the Third Test at Kanpur, where Gavaskar scored 76. He made 115 in the Fourth Test in Delhi, where India were unable to convert a 212 run first innings lead, resulting in a draw. After another stalemate in the Fifth Test, Gavaskar scored 123 in the Sixth Test, where Australia collapsed by an innings after India posted their fourth first innings in excess of 400 for the series. The series against Pakistan was similarly high scoring, with four draws, three of which did not reach the fourth innings. India won the Third and Fifth Tests in Bombay and Madras. At Madras, he made 166 in the first innings and was unbeaten on 29 when India brought up the winning runs. Having secured the series 2–0, Gavaskar was removed from the captaincy for the drawn Sixth Test. This occurred because Gavaskar had refused to tour the West Indies for another series immediately afterwards, asking for a rest. As a result, Gundappa Viswanath was appointed so that he could prepare his leadership skills for the tour. In the end the tour did not go ahead as the West Indian board were not interested in a team without Gavaskar. The season ended with a one-off Test against England in Bombay, which India lost. In the 13 Tests that season, he made 1027 runs at 51.35 with three centuries and four half-centuries. This ended a 14-month span in which Gavaskar played in 22 Tests and the 1979 Cricket World Cup. In that time, he scored 2301 Test runs including eight centuries. The 1980–81 season saw Gavaskar returned as captain for the Australasian tour, but it was to be the start of an unhappy reign for Gavaskar and India. He managed only 118 runs at 19.66 in the three Tests against Australia, but his impact in Australia was for a controversial incident. At the Melbourne Cricket Ground, when Gavaskar was given out by the Australian umpire Rex Whitehead, he ordered his fellow opener Chetan Chauhan off the field. Instead of abandoning the match, the Indian manager, SK Durani persuaded Chauhan to return to the match which India went on to win by 59 runs as Australia collapsed to 83 in their second innings. India drew the series 1–1 but the following three-Test series in New Zealand was to signal the start of a barren run of 19 Tests under Gavaskar of which India were to win only one and lose five. India lost to New Zealand 1–0, with Gavaskar managing 126 runs at 25.2. He finished the Oceania tour with 244 runs at 22.18, with only two half-centuries, making little impact. The 1981–82 Indian season saw a hard-fought 1–0 series win over England in six Tests. India took the First Test, before five consecutive draws resulted, four of which did not even reach the fourth innings. Gavaskar made 172 in the Second Test at Bangalore and reached a half-century on three further occasions to compile 500 runs at 62.5. India reciprocated England's visit in 1982 for a three-Test series, which was lost 1–0. Gavaskar made 74 runs at 24.66 but was unable to bat in the Third Test. The 1982–83 subcontinental season started well for Gavaskar on an individual note, as he made 155 in a one-off Test against Sri Lanka in Madras. It was the first Test between the two nations, with Sri Lankan having only recently been awarded Test status. Despite this, India were unable to finish off their novice opponents, the draw heralding a start of a winless summer. India played in twelve Tests, losing five and drawing seven. The first series was a six Test tour to Pakistan. India started well enough, drawing the First Test in Lahore, with Gavaskar scoring 83. Pakistan then defeated India in three consecutive matches. In the Third Test in Faisalabad, Gavaskar managed an unbeaten 127 in the second innings to force Pakistan into a run chase, but the other two losses were substantial, both by an innings. Despite holding on for draws in the last two Tests, Gavaskar was replaced by Kapil Dev as captain after the 3–0 loss. Despite his team's difficulties, Gavaskar remained productive with 434 runs at 47.18 with a century and three half centuries. Gavaskar went on to the West Indies for a five Test tour purely as a batsman, but could not reproduce the form that he had shown in the Caribbean in 1971 and 1976. He managed only 240 runs at 30, as India were crushed 2–0 by the world champions. Apart from an unbeaten 147 in the drawn Third Test in Georgetown, Guyana, his next best effort was 32. The 1983–84 season started with a home series against Pakistan, with all three matches being drawn. Gavaskar scored an unbeaten 103 in the First Test in Bangalore, and made two further half centuries to total 264 runs at 66. The Pakistan series was followed by a six Test series against the touring West Indies at the height of their powers. The First Test was held in Kanpur and India were crushed by an innings. Gavaskar had his bat knocked out of his hand by a hostile delivery from Malcolm Marshall before being dismissed. In the Second Test in Delhi, Gavaskar delivered his riposte to Marshall, hooking him for a consecutive four and six to start his innings. Gavaskar, unwilling to be dictated to by the Caribbean pacemen, hooked the short-pitched barrage relentlessly, reaching his half century in 37 balls. He then went on to score 121, his 29th Test century in 94 balls in his 95th test match, equalling Don Bradman's world record. He also passed 8000 Test runs in the innings, and was personally honoured by Indira Gandhi, the Prime Minister of India at the ground. The match was drawn. Gavaskar's 90 in the Third Test at Ahmedabad saw him pass Geoff Boycott's Test world record of 8114 career runs, but was insufficient to prevent another defeat. During the Fifth Test in the series, India were defeated by an innings at Calcutta to concede a 3–0 series lead. India had won only one of their 32 most recent Tests and none of their last 28. The crowd singled out the Gavaskar, who had made a golden duck and 20. Angry spectators pelted objects onto the playing arena and clashed with police, before stoning the team bus. In the Sixth Test in Madras, he compiled his 30th Test century in his 99th test match, with an unbeaten 236 which was the highest Test score by an Indian. It was his 30th Test century and third double century against the West Indies, propelling him to overtake Donald Bradman's 29 test centuries record. He had aggregated 505 at 50.50 for the series. With India having failed to win for 29 successive Tests, Kapil was sacked as captain and Gavaskar resumed leadership at the start of the 1984–85 season. The two Test tour of Pakistan resulted in two further draws, with Gavaskar compiling 120 runs at 40. The First Test against England saw India break through for its first Test victory in 32 matches. It proved to be a false dawn, with England squaring the series 1–1 in Delhi before another controversial Third Test at Eden Gardens in Calcutta. The hostile crowd watched as India batted for over two days to reach 7/437 after 203 overs. Angry with the slow pace of India's innings, the crowd chanted "Gavaskar down! Gavaskar out!" blaming him for India' performance. The local police chief reportedly asked Gavaskar to declare to placate the angry crowd. When Gavaskar led his team onto the field, he was pelted with fruit. Gavaskar vowed never to play at Eden Gardens again, and duly withdrew from the team for India's next fixture at the Bengali capital two years later, ending his record of 106 consecutive Tests. The match was drawn, but India conceded the series after losing the Fourth. The series ended 1–2, and with a poor display of 140 runs at 17.5, Gavaskar resigned, although he had already announced his intention to relinquish the leadership before the series. The change of captain improved the form of neither Gavaskar nor India as they toured Sri Lanka for a three-Test series. India were embarrassed 1–0 by the Test minnows at the time, with Gavaskar managing only 186 runs at 37.2. In 1985–86, India toured Australia, playing against a team in a poor form slump. India were unable to capitalise as all three Tests were drawn, but Gavaskar did. He scored an unbeaten 166 in the First Test in Adelaide and 172 in the Third Test in Sydney, ending the series with 352 runs at 117.33. A three-Test tour of England saw him score only 185 runs at 30.83, which India won 2–0 despite his unproductivity. In 1986–87, Gavaskar's final season in Test cricket, India faced a long season of eleven home Tests. Against a team regarded as the worst to leave Australian shores, Gavaskar made 90 in the second innings of the First Test in Madras (now Chennai), giving India a chance to reach the target of 348, which ended in a tie. He scored 103 in the Third Test to end the series with 205 runs at 51.66. The First Test against Sri Lanka in Kanpur saw Gavaskar's 34th and final Test century of 176. He scored 74 and 5 in the next two Tests as India won the three-match series 2–0. The five-Test series against arch enemies Pakistan was to be his last. Gavaskar scored 91 in the drawn First Test in Madras before withdrawing from the Second Test in Calcutta as he had promised. In the Fourth Test in Ahmedabad, Gavaskar's 63 made him the first batsman to pass 10,000 runs. With the teams locked 0–0 leading into the final Test in Bangalore, there was to be no fairytale. Gavaskar was dismissed for 96 in the second innings as India were bowled out to give Pakistan a 1–0 series win. Gavaskar was also a fine slip fielder and his safe catching in the slips helped him become the first Indian (excluding wicket-keepers) to take over a hundred catches in Test matches. In one ODI against Pakistan in Sharjah in 1985, he took four catches and helped India defend a small total of 125. Early in his Test career, when India rarely used pace bowlers, Gavaskar also opened the bowling for a short spell on occasions if only one pace bowler was playing, before a three-pronged spin attack took over. The only wicket claimed by him is that of Pakistani Zaheer Abbas in 1978–79. While Gavaskar could not be described as an attacking batsman, he had the ability of keeping the scoreboard ticking with unique shots such as the "late flick". His focus of technical correctness over flair meant that his style of play was usually less suited to the shorter form of the game, at which he had less success. His infamous 36 not out in the 1975 World Cup, carrying his bat through the full 60 overs against England, led Indian supporters to storm the field and confront him for scoring so slowly when India needed nearly a run a ball to win; at the end of the game India had lost only three wickets but scored 200 runs less than England. Gavaskar almost went through his career without scoring a one-day century. He managed his first (and only ODI century) in the 1987 World Cup, when he hit 103 not out against New Zealand in his penultimate ODI innings at Vidarbha Cricket Association Ground, Nagpur. He held the record for the highest number of test centuries (34) before Sachin Tendulkar went past him in 2005. He broke Donald Bradman's record 29 Test centuries going on to get 34. He is a joint holder of the record for scoring centuries in both the test match innings on three separate occasions along with Australia's Ricky Ponting and David Warner. He captained the national team on and off over a period between 1978 and 1985, which included a great 2 – 0 win over Pakistan in 1979/80. He is the first Indian cricketer to carry his bat in test cricket. He has scored 127 not out in the Faisalabad Test in the year 1983 and became the Ist Indian to carry the bat in a test match. Gavaskar's 100s in first class cricket. Gavaskar was the first cricketer to play 100 consecutive test matches. 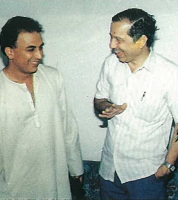 Gavaskar with former BCCI vice-president Dnyaneshwar Agashe. After retirement, he has been a popular, if sometimes controversial commentator, both on TV and in print. He also served as an advisor to the India national cricket team during the home series against Australia in 2004. He was the Chairman of the ICC cricket committee until the time he was forced to choose between commenting and being on the committee. He left the committee to continue his career as a broadcaster. The inaugural Mansur Ali Khan Pataudi Memorial Lecture was given by Gavaskar on 20 February 2013 at Taj Coromandel, Chennai. In 2003, he became the first and till now the only Indian to have delivered a MCC Spirit Of Cricket Cowdrey Lecture. He was the 3rd lecturer in the history of the Cowdrey lecture. Gavaskar also tried his hand at acting on the silver screen. He played the lead role in the Marathi movie "Savli Premachi". The movie did not receive much appreciation though. After many years he appeared in a guest role in a Hindi movie "Maalamaal". He has sung a Marathi song "Ya Duniyemadhye Thambayaala Vel Konala" which was written by noted Marathi lyricist Shantaram Nandgaonkar. The song depicted the similarities between a cricket match and real life. It had become popular. In 1980, Gavaskar received the Padma Bhushan award for his successful International career representing Team India from the former Indian President Neelam Sanjiva Reddy. On 22 December 1994, Gavaskar was sworn in as Bombay Sheriff - an honorary post, for a year, at Raj Bhavan in Mumbai in the presence of former Governor P C Alexander and former Chief minister Sharad Pawar. In 1996, The Border-Gavaskar Trophy has been instituted in his co-honour. It was decided that any bilateral Test series between India and Australia will be called as Border-Gavaskar Trophy, named after iconic players Allan Border and Sunil Gavaskar. Both these players scored more than 10,000 runs in their respective Test careers and captained their teams. "Gavaskar Stadium" in his home district of Vengurla has been named after him. On 21 November 2012, Gavaskar was conferred with BCCI's prestigious Col. CK Nayudu Lifetime Achievement Award at the BCCI Annual Awards Function 2011-12. The Lifetime Achievement Award given to Gavaskar carried a citation, trophy and a cheque for 25 lakh Rupees and he received this award from then BCCI president N. Srinivasan. On 15 October 2017, Gavaskar inaugurated a cricket field in Louisville in the state of Kentucky in United States, thus making it the first international sporting facility named after an Indian sportsperson. The "Sunil M. Gavaskar Cricket Field", serves as the home ground for the Louisville Cricket Club, which is part of the 42-team MidWest Cricket League. Gavaskar was presented the keys of the ground by Louisville Mayor Greg Fischer. On 25 March 2008, Malcolm Speed, ICC chief executive, told Gavaskar "very clearly", during a meeting between the two at Dubai, that he would have to quit his post at the ICC if he failed to give up his job of commentator and newspaper columnist, in which capacity he has frequently criticised his employers and levelled serious accusations of racism. He sparked a controversy in early 2008 for his comments on the contentious Sydney Test Match: "Millions of Indians want to know if it [match referee Mike Procter's verdict against Harbhajan Singh was a 'white man' taking the 'white man's' word against that of the 'brown man'. Quite simply, if there was no audio evidence, nor did the officials hear anything, then the charge did not stand." Despite the fact that Gavaskar's comment referenced Mike Procter and not the ICC, Australian writer Gideon Haigh said that, if Gavaskar genuinely believed this, "then he should almost certainly resign, for if the ICC is a bastion of 'white man's justice', Gavaskar bears some of the blame for having failed to change it. He has recently been selected as the interim president of BCCI replacing N. Srinivasan"
Born in a Marathi speaking family to Meenal (née Mantri) & Manohar Gavaskar, Gavaskar is married to Marshneill Gavaskar (née Mehrotra), daughter of a leather industrialist from Kanpur. Gavaskar family originates from Gaud Saraswat Brahmins of Goa. Their son, Rohan, was also a cricketer who played 11 One Day Internationals for India, but could not cement his spot in the team. Rohan was given the name "Rohan Jaivishwa" by his father as a tribute to his 3 favourite cricketers – Rohan Kanhai; M. L. Jaisimha; and Rohan's uncle, Gundappa Vishwanath – although his name is usually recorded as Rohan Sunil Gavaskar. His maternal uncle was retired Indian cricketer Madhav Mantri. His sister Kavita Viswanath is married to cricketer Gundappa Viswanath. His other sister - Nutan Gavaskar was the honorary general secretary of Women's Cricket Association of India (WCAI). Gavaskar is an ardent devotee of Bhagavan Sri Sathya Sai Baba. 1 England Barabati Stadium, Cuttack 27 January 1982 71 (87 balls: 10x4) India won by 5 wickets. 2 Sri Lanka Sharjah Cricket Stadium, Sharjah 13 April 1986 71 (109 balls: 6x4, 1x6) India won by 3 wickets. 3 Sri Lanka Nehru Stadium, Guwahati 11 January 1987 70* (83 balls: 6x4, 1x6) India won by 8 wickets. 4 Sri Lanka Moti Bagh Stadium, Vadodara 15 January 1987 69 (94 balls) India won by 94 runs. 5 New Zealand Vidarbha Cricket Association Ground, Nagpur 31 October 1987 103* (88 balls: 8x4, 3x6) India won by 9 wickets. Brown, Alex. "Gavaskar slams 'white man' ban." The Age, 14 January 2008. Haigh, Gideon. "Gavaskar's double role." Cricinfo. 15 January 2008. (Retrieved 22 November 2008). ^ "BCCI names Gavaskar for CK Nayudu award". Wisden India. 25 October 2012. ^ "Gavaskar conferred with CK Nayudu Lifetime Achievement award". Retrieved 21 November 2012. ^ "Supreme Court splits BCCI, appoints Sunil Gavaskar as President". IANS. news.biharprabha.com. Retrieved 28 March 2014. ^ "St Xavier's kicks off 150th anniversary with star alumni". Vinamrata Borwankar. The Times of India. 7 January 2018. Retrieved 29 April 2018. ^ "140 years on, St Xavier's school keeps history alive". Hindustan Times. 31 January 2010. Retrieved 29 April 2018. ^ a b c d e f g h i j k l m n o p q Armstrong, Geoff (2002). ESPN Legends of Cricket. Allen & Unwin. pp. ??. ISBN 1-86508-836-6. ^ Lokapally, Vijay (11–17 May 2002). "A legend in two lands". Sportstar. Archived from the original on 16 July 2009. Retrieved 8 June 2009. ^ Biswas, Soutik (16 June 2007). "Leader Article: Calypso Rules". The Times of India. Retrieved 8 June 2009. ^ a b c d e f g h i j k l m n o p q r Test Batting and Fielding in Each Season by Sunny Gavaskar, CricketArchive. Retrieved 5 September 2008. ^ "Pakistan's protest not the first | ESPN Cricinfo". Content-usa.cricinfo.com. Retrieved 21 December 2010. ^ "Sunil Gavaskar : Facts, Achievements, Statistics and Records, Photo Gallery". Swapnilagaskar.tripod.com. 10 July 1949. ^ "Sunil Gavaskar | Stats & Records | Cricket News". Cricket365. ^ "Sunil Gavaskar | Cricket Players and Officials". ESPNcricinfo. ^ "Sachin Tendulkar equals Sunil Gavaskar's record of first class 100s". The Times of India. Press Trust of India. 8 February 2013. ^ "Tiger brought fun to the game". The Hindu. 21 February 2013. Retrieved 25 February 2013. ^ Sunil Gavaskar's IMDb entry. Retrieved 16 November 2009. ^ "Happy Birthday, Sunny! 10 facts about Sunil Gavaskar you might not know". indianexpress.com. The Indian Express [P] Ltd. Retrieved 15 February 2018. ^ "India vs Australia 2016-17: All you need to know about history of Border-Gavaskar Trophy". cricketcountry.com. © 2018 India.com. Retrieved 15 February 2018. ^ "Golden oldie brothers-in-law in the Gavaskar stable". indiatimes.com/. Bennett, Coleman & Co. Ltd. Retrieved 15 February 2018. ^ "Cricket ground in USA named after Sunil Gavaskar". Bennett, Coleman & Co. Ltd. Retrieved 15 February 2018. ^ "Cricket ground in Kentucky, US named after Sunil Gavaskar". HT Media Limited. Retrieved 15 February 2018. ^ Gavaskar to decide on future with ICC, 25 March 2008, ESPNcricinfo. Retrieved 5 September 2008. ^ Quoted in Brown 2008. ^ Sunny Days : Sunil Gavaskar's Own Story. ^ V.V.S. Laxman bats for new cause Archived 30 September 2007 at the Wayback Machine, 10 November 2005. Press Trust on India. Retrieved on 5 September 2008. ^ "Sathya Sai Baba, Realizing Supreme Beatitude by Sunil Gavaskar". ^ "1981–1982 India v England – 3rd Match – Cuttack". ^ "1985–1986 Austral-Asia Cup – 1st Semi-Final – India v Sri Lanka – Sharjah". ^ "1986–1987 India v Sri Lanka – 2nd Match – Guwahati". ^ "1986–1987 India v Sri Lanka – 4th Match – Vadodara (Baroda)". ^ "1987–1988 Reliance World Cup – 24th Match – India v New Zealand – Nagpur". ^ "Gavaskar's double role | ESPN Cricinfo". Content-www.cricinfo.com. Retrieved 21 December 2010. Wikimedia Commons has media related to Sunil Gavaskar.